Our New FPN 2015 LE Pen! We have noticed that you are using advert blocking software, such as Ad Block Plus. FPN, which is an entirely volunteer run site, relies on advertising for funding of out-of-pocket and running costs like hosting. Please be so kind to add fountainpennetwork.com to your ad blocking whitelist or disable ad blocking when you visit FPN. If you prefer not to see any adverts, support FPN by donating towards an Ads Free view, either by a monthly contribution, or a yearly contribution. Thank you very much in advance! There are already a few Supra Brass reviews on FPN, be sure to check those out. 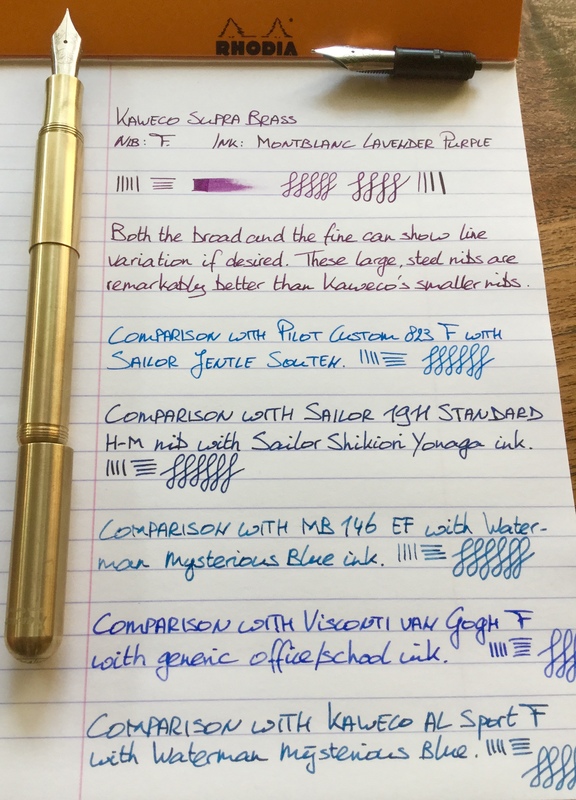 At the end of this review I've copied my thoughts (originally from http://www.fountainp...-short-of-love/) about often-heard complaints about Kaweco, which I feel are worth repeating. ^--This photo shows the pen as well as text written with the fine nib (in purple), as well as comparisons with some other pens. This Supra Brass was an impulsive buy. I was saving up to buy a Platinum instead. My son tried it at our local brick and mortar pen store and he handed it to me to try as well. It had a broad nib (didn't have a broad yet), felt great in the hand and wrote really well. I bought it and the Platinum will have to wait a while. As for the design and the material: you either love it or hate it, and I love it. There's just something about brass that I like (you can get the Supra in other metals as well). The design is at once understated, refined and, well, different. Aesthetically, the large #6 nib fits the pen really well and overall it's just beautiful. A totally unique feature is the removable extender piece, which can be used to shorten the pen significantly. Ergonomically, the pen is right for me. But it will be the wrong pen for many people, simply because it is very heavy. Brass is heavy. I have large hands and it doesn't bother me at all. If you require a light pen, then don't consider the Supra. In terms of how well it handles and sits in the hand: brass is smooth but not slippery. Pens with stainless steel sections, such as my Visconi van Gogh, feel very slippery to me and make my fingertips sweaty, with the result that I'm always struggling a bit with my grip. Not so with the Supra: the brass just feels great, it's not slippery at all and long sessions are comfortable. The diameter and the taper of the section are just right for me, and I expect these dimensions will be about right for most people. With the extender section in place, the pen can (and should) be used unposted. Posting it with the extender will make the pen too long, too heavy as well as too back-heavy. If you want a small pocket pen, remove the extender and what remains is something not much larger than a lipstick tube. In this mode, posting is essential and you can screw the cap on the back of the barrel. Posted without the extender, the pen is noticeably less heavy than it is unposted with the extender in place. So the extender not only gives you a size option, but also a weight option. A totally unique feature, that some (like me) will adore, but others might perceive it as a gimmick. Ink capacity depends on the use of the extender. It's a cartridge/converter pen. Without the extender, only a regular standard international cartridge will fit. Even the hyper-small, adorable Kaweco mini-converter (probably the most hated converter ever) won't fit, unless you stop extending the piston at 75%. With the extender piece in place, the pen accommodates all standard international cartridges (both short and tall) as well as full-size converters. Nib and writing. I bought this pen with a broad nib and also ordered a spare fine nib (a spare nib+feed for a Supra costs €26 full retail). Kaweco nibs are relatively cheap and nib swapping is quite literally a 1-minute job with Kaweco pens, which in my view is one of their more attractive features. The nib is #6 size, fairly large, and its size perfectly fits the rest of the pen. The engravings are stylish. The feed is one of the larger feeds I've seen, with a lot of big fins. ^---What it's all about: the F and B nibs of the Supra. Out of the box, the broad defined the word 'smooth'. I can't remember ever having used a smoother nib. To me, smoothness is not the holy grail. I prefer some feedback and character. 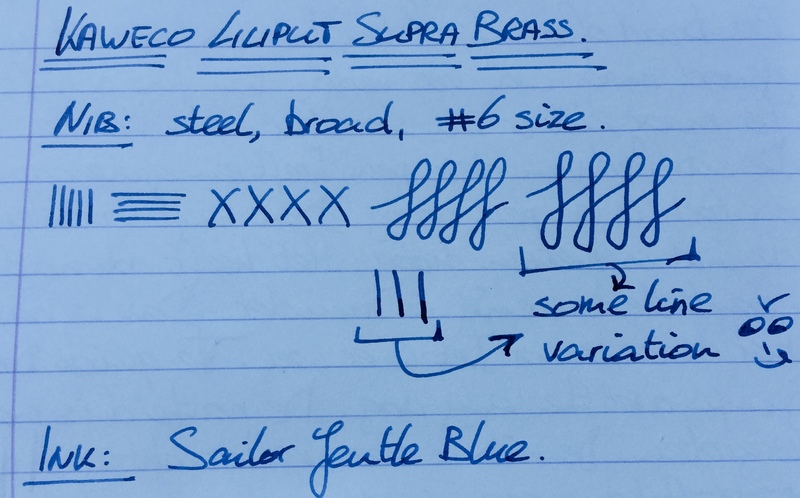 The broad immediately performed well with Sailor Jentle Blue: wet enough for comfortable writing (including fast writing and signatures) but dry enough to show nice shading. A nice balance. Since I prefer some feedback and just a bit more wetness, I tuned this broad nib a little and quickly got it working exactly according to my personal preferences. But again: out of the box, it was already a very, very good steel nib. ^--This photo shows text written with the broad nib. Then, the fine. In general I prefer nibs ranging from Japanese fine to Western fine, so the broad would probably would not be used that much. It's wonderful for things like postcards, quick note taking, sketching and people with large, flowery handwriting. The fine, however, now that's right up my alley. This is one of the very few nibs that performed perfectly right out of the box, with zero need for any kind of adjustment or tuning. It immediately performed very well with J. Herbin Bleu Nuit and with Sailor Jentle Blue, but I settled on Montblanc Lavender Purple. In terms of feel, this is the best steel nib I own. And although I like the small nibs in my Kaweco AL Sport and Classic Sport pens, the Supra nib is in a totally different league. Smooth but with loads of feeling and character. It's tough stainless steel, yet if you want it to it will give you considerable line variation with very little effort - and it will never, ever scratch, no matter how hard you press down. Line width is surprisingly narrow; check the photo for comparisons with my Pilot Custom 823 F, which is a Japansese fine... In terms of writing sensation, this nib is pure joy. Yes, the pencil-like feedback of my Sailors is still unmatched, but if you'd ask me if the nib of my Custom 823 F is nicer than this steel Supra nib, I'd have to think about it. Really. Also, consider this. If you order an 823 from Japan and the nib is a dud, what are you going to do? With Kaweco, you return a faulty nib under warranty and get a new one. Screw it in and off you go. If you damage it, you pay €26 for a new one and you're back in business. At this price point, the Supra nibs are unbeatable. At any price point, I can't think of a better steel nib. Conclusion. With a street price of about €95 and an extra nib retailing at €26, this indestructible and distinctive pen punches way above its class. People who like line variation but want a pocket pen sturdy enough to derail a train, the Supra is your ticket. Do not dismiss the Supra if you dislike the AL Sport or the Classic Sport - please judge this pen on its own, because the nibs are in a totally different class. This is a pen you'll have to pry out of my cold dead hands. It's a pocket pen! Don't buy it if you require 2 mL of your own hyper-special home-brewed ink mixture in a pen. It's a steel-nibbed pen, the nibs are cheap (in terms of price) and are mass-produced by Bock. If you expect it to write better OOTB than your vintage Montblanc 149, then don't buy one. Having said that, personally I really like these nibs. Some new Kaweco nibs are too dry. I'm not making excuses for that, but it's a fact. Accept it, or don't buy one. The dryness will pass. The more you use it, the faster it will pass. Once the pen plateaus out, the flow will be very nice and even on the wet side. If you can't live with the dryness, there are non-invasive tricks you can use or you can seek help from a nibmeister (but note that most of these pens *will* get wetter over time, so if you tune the nib early-on, you might have to re-tune it later). In general, thoroughly and repeatedly flush the nib+feed. After that (not before that! ), it will help a lot if you unscrew the nib+feed and put it in a bottle of the ink you intend to use for 12 hours or so. Take it out, clean off with a rag, screw back into the section, pop in a cartridge of the same ink, and you will have accelerated the plateau-ing out process a lot. Edited by TheDutchGuy, 13 July 2018 - 18:40. Thank you for the great review. I've been on the verge of getting one of these for a while and I think you have me convinced. Thanks! If you decide to get one, then be sure to let us know if you're happy with it. My F nib seems finer than usual, definitely more in the direction of a western EF. 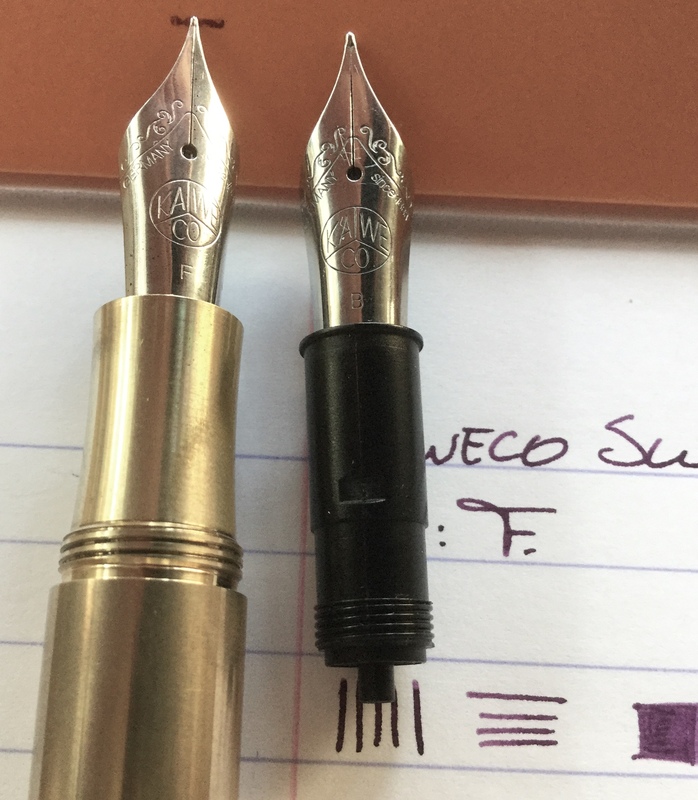 My AL Sport and Classic Sport also have F nibs, but those are juicy western F's. Having said that, I love the F nib of my Supra. Edited by TheDutchGuy, 15 July 2018 - 17:31. Oh, I want a "remarkably better" nib to be available for the stubby little Kawecos! Try an EF. My son just bought a Kaweco Special Brass with an EF nib. That nib is the same size as the nibs in the AL Sport and the Classic Sport. I'm blown away by how good it is. My son's a lefty but that EF is so good and so smooth that he can use it effortlessly. Also this pen doesn't have the common dryness issues, it performs totally great right OOTB. I recently saw a YouTube video (can't remember which!) that mentioned Kaweco have *very* recently switched their nibs from Bock to JoWo. No fanfare, and no *visible* changes to the feed and assembly, just a change of manufacturer for the nib. If true, that *might* explain any recent improvements in performance. I will try one of the newer nibs when I have the opportunity. My experience with Sports (ice medium, guilloche extra fine, brass extra fine) and Lilliputs (brass wave medium and copper fine) that I bought several years ago was that they were dry dry dry but responded well to increasing the flow and became wonderful to use. On the other hand, I very recently got another brass Sport with an extra fine nib (because I'm a Kaweco addict!) and this nib was flawlessly juicy right out of the tin, so it writes a slightly finer line, not having needed to be opened up to increase flow. Maybe I need to try some more JoWo nibs now! I also have a Supra in extra fine and it's a wonderful juicy writer, almost as lovely to use as my 1970's vintage Sports with gold nibs. The long slender tines on the supra nib make for a nice bouncy ride! If Kaweco ever upgrades the Dia to this #6 nib, I'll instantly buy one. They look so silly with the #5! The long slender tines on the supra nib make for a nice bouncy ride! If Kaweco ever upgrades the Dia to this #6 nib, I'll instantly buy one. Advert blocking software, such as Ad Block Plus, appears to be active. FPN relies a.o. on advertising for funding of running costs like hosting. Please be so kind to disable ad blocking for fountainpennetwork.com. If you prefer to see no adverts, support FPN by donating towards an Ads Free view, either by a monthly contribution, or a yearly contribution. Thank you very much in advance!